Combine pasta, meat, mangos, 1/3 cup onions and cilantro in large bowl. Add dressing; toss to evenly coat. 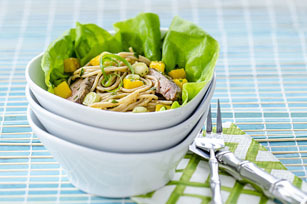 Place lettuce leaves in 8 salad bowls; fill with pasta mixture. Prepare using Kraft Asian Sesame Dressing. Garnish lettuce cups with orange zest or orange slices. Mix dressing with 1/4 tsp. Chinese five-spice powder before tossing with salad ingredients as directed. The irresistible combination of flavours and colours in these lettuce cups is sure to make them a hit with family and friends alike. And as a bonus, they can be part of a healthful eating plan.